I'm an artist teacher, currently working as head of art in an independent boarding school in the south of England. I have been teaching for nearly 30 years (gulp!) after a short period as a 'full-time' artist. I make paintings (and sometimes prints), working from drawings, photographs and memory. I need to find an emotional connection to the work - I used to work a lot from landscape and the sense of place provided that. In the last few years I have reintroduced figures - wanting to try and say something about the connections between people and place. What I choose to paint seems to come pretty intuitively but there's normally a connection to some experience in my own life. Currently there's 2 paintings sitting in my office at work I'd like to finish (one I started in 2013!) but actually the only real live project at the moment is producing digital work for the digital sketchbook circle. Nevertheless I am using that to develop ideas, so I don't see it as anything different. In fact it's important that it's not different from my usual practice. I think I have learnt over the years that you need to use every opportunity to make art - I always try and keep some germ of an idea in my head so there's something to use when called upon to 'make art'. I have several sketchbooks that make progress slowly. I have a square 8"x8" spiral book I use for observational drawing when travelling and when on holiday; there's a couple of A4 ideas books that I scribble, stick and sketch into - often it's a printout of the existing state of a painting which I then work on with drawing pens at home in front of the TV; an A5 landscape whose rules are get it down really fast, work only in black and white and always from observation. My main go-to-book is a Seawhite A6 landscape hardback that I carry pretty much everywhere. For this book the only rule is use the next page. I have been using these A6 books for over 10 years and there must be about thirty or so now. Like many teachers I find it hard to find the time to make my own work - the refurbishment of a small cottage and garden has been the time killer in the last two years, so the sketchbook circle has been a really good discipline. I need deadlines and challenges. In fits and starts. During term time I rarely have a moment to consider my own creative practice so it's in the holidays that I get going. 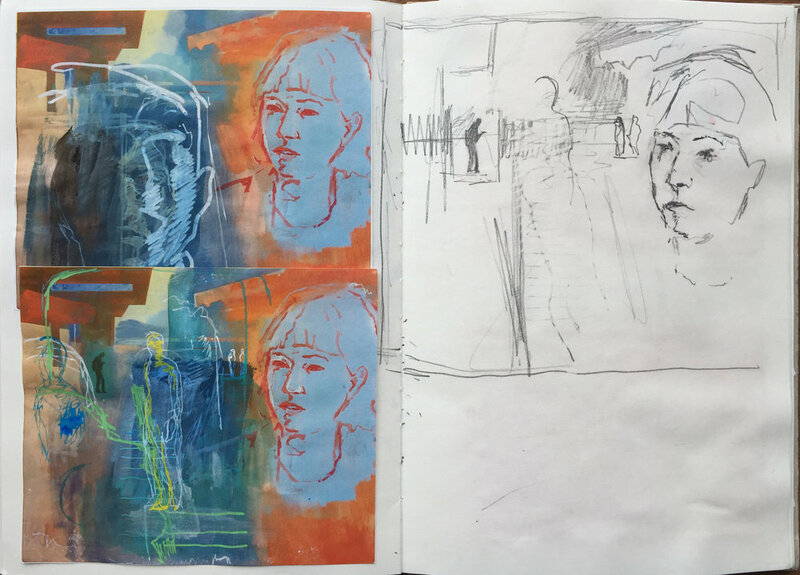 Normally I look back on photos and sketchbook work and begin to make studies in one of my A4 books. For drawing: a grey Pental colourbrush pen, a small white Posca, a Staedtler Graphite 777 Mechanical Pencil 0.5 mm tip and a black fineliner. Although I have a collection of about 100 pens! For painting: watermixable oil colour. I love working with these: real oil but without the smelly solvents. Galleries - I find there's nothing like a long day in London visiting exhibitions and some smaller galleries to feel fired up and keen to be making my own stuff. Otherwise increasingly I look online. I'm rubbish at remembering who's said what, or where I read something. I think you have to find your own way to solve problems and work things out.